Celebrating 80 years of Gods blessings. 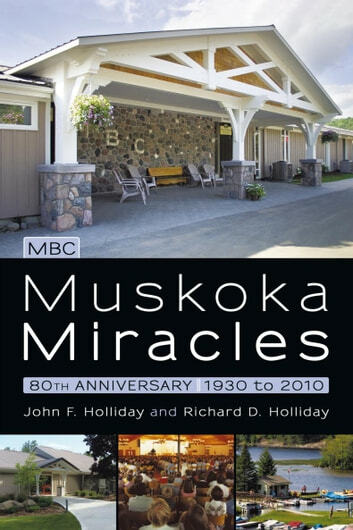 Muskoka Baptist Conference is Canadas largest year-round family and retreat Centre, nestled in Ontarios favourite region of lakes and forested hills. It offers the beauty and sandy beach of Mary Lake, at the mouth of the Muskoka River. It is a two hour drive north of Toronto, just south of Huntsville. Excellence in accommodations and delicious meal service is paralleled by a wonderful world of sports facilities indoors and outside. The spacious Chapel and various Bible study meeting rooms reflect the central purpose through 80 years. It is Muskokas Bible Centre with programming for all ages. MBC also operates a full summer camp for children and teensCamp Widjiitiwin. The word translates Fellowship. 2010 is the 80th anniversary for MBC. 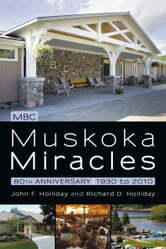 The first eight chapters of Muskoka Miracles were written in 1970 by one of the two founders, Rev. Dr. John F. Holliday. Rev. Dr. Richard D. Holliday authored this 80th year edition. It add more than 200 pictures from 1930 to 2010, and presents the exciting history and fascinating stories about Gods miracles along the way.